Founded in 1995 by the visionary California wine pioneer, Jess Jackson, Lokoya winery focuses on making the best 100% Cabernet Sauvignon from the four renowned mountain appellations of Napa Valley: Mount Veeder, Howell Mountain, Diamond Mountain, and Spring Mountain. Each is extremely small-production, with an average of 1500-2000 cases produced each year across all four appellations. 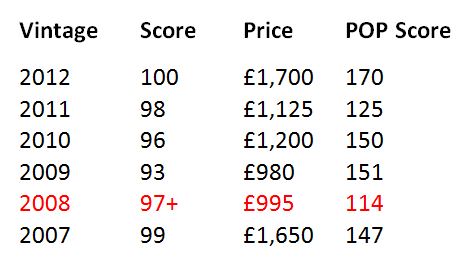 Compared to other top 2008 Napa Cabernet Sauvignons, the Lokoya 2008 stacks up impressively at £995 per case of 6 in bond, or just over £165 per bottle. Awarded 97+ points by Robert Parker, the Lokoya 2008 is cheaper than other 2008 wines such as Harlan, Scarecrow, and Screaming Eagle, all of which scored from 93+ to 96 points from Parker. In fact, it is nearly a 90% discount to Screaming Eagle, which scored 95 points in 2008 and a 60% discount to Scarecrow, which scored 93+ points. Lokoya Mount Veeder consistently scores well from Robert Parker and the table below shows that the 2008 is currently the most compelling buy of recent vintages, with the lowest POP score. Another blockbuster, the 2008 Cabernet Sauvignon Mt. Veeder, which has the largest production, exhibits a deep blue/purple color along with notes of burning embers, charcoal, sweet black currant liqueur, licorice and scorched earth. It possesses fabulous fruit along with full-bodied power, a voluptuous texture and beautiful density as well as richness. It is not far off the quality of the brilliant 2007.